Well, I might not have gone bananas, but I am certainly going to need a plentiful supply this year. 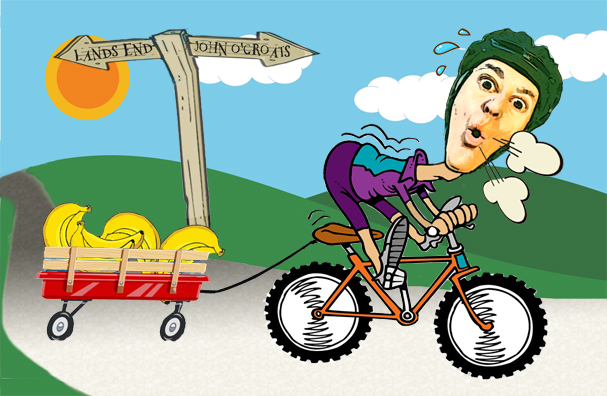 This coming September I am joining hundreds of other cyclists to ride from Land's End to John O'Groats over nine days to raise money for The Alzhiemer's Society (so I'll probably be eating plenty of bananas). This is a charity very dear to me since my family knows only too well the life-robbing nature of this disease. In fact, you may already know that later versions of In My Diary include a Dementia Aid Clock facility which proved to be very useful in our case, until the disease became too severe. Please take a look at my event page for more details of my epic journey, and if you could spare the cost of a cup of coffee or two, that would be fantastic.